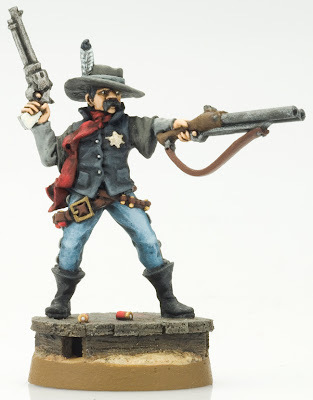 Finished this dude last night, in prep for some Old West games this afternoon. I think I wanted my Sheriff and 2 deputies to be quite bright in their colour schemes, to stand out from the rest of the old west rabble. The scarf provided a chance to add some colour to the mostly blue and grey. The deputies have suits on, so will probably go for a Pinkerton men look. Maybe one in dark purple, and the other in pale turquoise. Might even try pinstripes. The Vigilantes will be mostly brown and blacks.